Calcareous shores, sedge meadows, fens; swamps of cedar, tamarack, and other conifers (less often hardwoods); moist ground along rivers and streams. 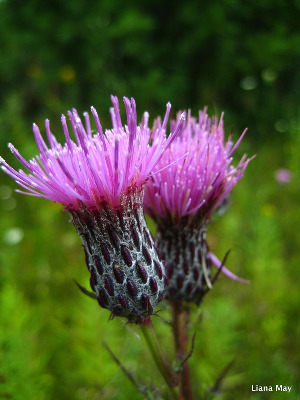 The flowers are a deep rose-purple; combined with the relatively unarmed stem, they make this species unusually attractive as thistles go. White-flowered plants [f. lactiflorum Fernald] have been collected in Keweenaw, Livingston, and Oakland Cos. The phyllaries are less acute (even obtuse or blunt) compared with our other small-headed thistles (C. arvense and C. palustre, both introduced, weedy species), which have pale pink-purple flowers. Occasionally the leaves are lightly tomentose beneath, but not enough so to hide completely the green surface of the blade. MICHIGAN FLORA ONLINE. A. A. Reznicek, E. G. Voss, & B. S. Walters. February 2011. University of Michigan. Web. 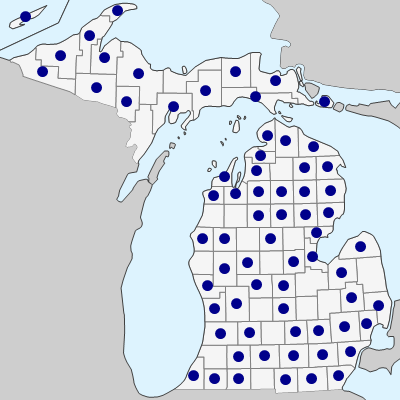 April 19, 2019. https://michiganflora.net/species.aspx?id=288.